Lady Antebellum achieved its first two number ones in 2009. Hot Country Songs is a chart that ranks the top-performing country music songs in the United States, published by Billboard magazine. In 2009, 30 different songs topped the chart in 52 issues of the magazine, based on weekly airplay data from country music radio stations compiled by Nielsen Broadcast Data Systems. Four acts achieved their first number-one hit in 2009. The first was Mac McAnally, whose appearance as a guest vocalist on Kenny Chesney's cover version of his 1990 song "Down the Road" gave him his first appearance at the top of the chart in a career which stretched back to the 1970s. The group Lady Antebellum spent one week at number one in July with its first chart-topper, "I Run to You", and returned to the top with "Need You Now", which spent the last five weeks of the year at number one, the longest spell at the top by a single song. The six weeks which the trio spent at number one was the most by any act in 2009. "Need You Now" also achieved considerable crossover success, topping the Adult Contemporary and Adult Top 40 charts and reaching number 2 in Billboard's all-genre singles chart, the Hot 100. 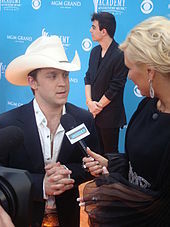 In October, both Justin Moore and Chris Young reached the top spot for the first time, with "Small Town USA" and "Gettin' You Home (The Black Dress Song)" respectively. This would be the first of five consecutive number-one hits for Young over a two-year period. In addition to Lady Antebellum, Jason Aldean, Dierks Bentley, Kenny Chesney, Toby Keith, Brad Paisley, Rascal Flatts, Darius Rucker and Sugarland all achieved two number ones in 2009. Aldean's "Big Green Tractor" spent four weeks at number one in the fall, the first song to spend four weeks in the top spot since February of the previous year. Keith Urban was the only act to reach number one with three different songs, "Sweet Thing", "Only You Can Love Me This Way", and "Start a Band", a duet with Brad Paisley. "Small Town USA" gave Justin Moore his first chart-topper in October. Jason Aldean's "Big Green Tractor" was the first song for eighteen months to spend more than three weeks at number one. "Gettin' You Home (The Black Dress Song)" was the first of five consecutive chart-toppers for Chris Young. "Gettin' You Home (The Black Dress Song)"
^ "Mac McAnally Chart History (Hot Country Songs)". Billboard. Retrieved October 27, 2017. ^ Morris, Edward (September 11, 2009). "Hit Songwriter Mac McAnally Debuts Down by the River". CMT. Retrieved October 27, 2017. ^ "Lady Antebellum Give Thanks for First No. 1, "I Run to You"". CMT. August 25, 2009. Retrieved October 27, 2017. ^ "Lady Antebellum Need You Now Chart History: Adult Contemporary". Billboard. Retrieved May 23, 2018. ^ "Lady Antebellum Need You Now Chart History: Adult Top 40". Billboard. Retrieved May 23, 2018. ^ Monger, James Christopher. "Lady Antebellum Biography & History". AllMusic. Retrieved May 23, 2018. ^ Gilbert, Calvin (September 28, 2009). "Justin Moore's Small Town Values Pay Off". CMT. Retrieved October 27, 2017. ^ Morris, Edwards (November 25, 2009). "Chris Young Relishes First No. 1 Single, "Gettin' You Home (The Black Dress Song)"". CMT. Retrieved October 27, 2017. ^ "Chris Young Chart History (Hot Country Songs)". Billboard. Retrieved October 27, 2017. ^ Trust, Gary (September 18, 2009). "Chart Beat Wednesday: Taylor Swift, Jason Aldean, Muse". Billboard. Retrieved October 27, 2017. ^ "Hot Country Songs chart for January 3, 2009". Billboard. Retrieved September 7, 2010. ^ "Hot Country Songs chart for January 10, 2009". Billboard. Retrieved September 7, 2010. ^ "Hot Country Songs chart for January 17, 2009". Billboard. Retrieved September 7, 2010. ^ "Hot Country Songs chart for January 24, 2009". Billboard. Retrieved September 7, 2010. ^ "Hot Country Songs chart for January 31, 2009". Billboard. Retrieved September 7, 2010. ^ "Hot Country Songs chart for February 7, 2009". Billboard. Retrieved September 7, 2010. ^ "Hot Country Songs chart for February 14, 2009". Billboard. Retrieved September 7, 2010. ^ "Hot Country Songs chart for February 21, 2009". Billboard. Retrieved September 7, 2010. ^ "Hot Country Songs chart for February 28, 2009". Billboard. Retrieved September 7, 2010. ^ "Hot Country Songs chart for March 7, 2009". Billboard. Retrieved September 7, 2010. ^ "Hot Country Songs chart for March 14, 2009". Billboard. Retrieved September 7, 2010. ^ "Hot Country Songs chart for March 21, 2009". Billboard. Retrieved September 7, 2010. ^ "Hot Country Songs chart for March 28, 2009". Billboard. Retrieved September 7, 2010. ^ "Hot Country Songs chart for April 4, 2009". Billboard. Retrieved September 7, 2010. ^ "Hot Country Songs chart for April 11, 2009". Billboard. Retrieved September 7, 2010. ^ "Hot Country Songs chart for April 18, 2009". Billboard. Retrieved September 7, 2010. ^ "Hot Country Songs chart for April 25, 2009". Billboard. Retrieved September 7, 2010. ^ "Hot Country Songs chart for May 2, 2009". Billboard. Retrieved September 7, 2010. ^ "Hot Country Songs chart for May 9, 2009". Billboard. Retrieved September 7, 2010. ^ "Hot Country Songs chart for May 16, 2009". Billboard. Retrieved September 7, 2010. ^ "Hot Country Songs chart for May 23, 2009". Billboard. Retrieved September 7, 2010. ^ "Hot Country Songs chart for May 30, 2009". Billboard. Retrieved September 7, 2010. ^ "Hot Country Songs chart for June 6, 2009". Billboard. Retrieved September 7, 2010. ^ "Hot Country Songs chart for June 13, 2009". Billboard. Retrieved September 7, 2010. ^ "Hot Country Songs chart for June 20, 2009". Billboard. Retrieved September 7, 2010. ^ "Hot Country Songs chart for June 27, 2009". Billboard. Retrieved September 7, 2010. ^ "Hot Country Songs chart for July 4, 2009". Billboard. Retrieved September 7, 2010. ^ "Hot Country Songs chart for July 11, 2009". Billboard. Retrieved September 7, 2010. ^ "Hot Country Songs chart for July 18, 2009". Billboard. Retrieved September 7, 2010. ^ "Hot Country Songs chart for July 25, 2009". Billboard. Retrieved September 7, 2010. ^ "Hot Country Songs chart for August 1, 2009". Billboard. Retrieved September 7, 2010. ^ "Hot Country Songs chart for August 8, 2009". Billboard. Retrieved September 7, 2010. ^ "Hot Country Songs chart for August 15, 2009". Billboard. Retrieved September 7, 2010. ^ "Hot Country Songs chart for August 22, 2009". Billboard. Retrieved September 7, 2010. ^ "Hot Country Songs chart for August 29, 2009". Billboard. Retrieved September 7, 2010. ^ "Hot Country Songs chart for September 5, 2009". Billboard. Retrieved September 7, 2010. ^ "Hot Country Songs chart for September 12, 2009". Billboard. Retrieved September 7, 2010. ^ "Hot Country Songs chart for September 19, 2009". Billboard. Retrieved September 7, 2010. ^ "Hot Country Songs chart for September 26, 2009". Billboard. Retrieved September 7, 2010. ^ "Hot Country Songs chart for October 3, 2009". Billboard. Retrieved September 7, 2010. ^ "Hot Country Songs chart for October 10, 2009". Billboard. Retrieved September 7, 2010. ^ "Hot Country Songs chart for October 17, 2009". Billboard. Retrieved September 7, 2010. ^ "Hot Country Songs chart for October 24, 2009". Billboard. Retrieved September 7, 2010. ^ "Hot Country Songs chart for October 31, 2009". Billboard. Retrieved September 7, 2010. ^ "Hot Country Songs chart for November 7, 2009". Billboard. Retrieved September 7, 2010. ^ "Hot Country Songs chart for November 14, 2009". Billboard. Retrieved September 7, 2010. ^ "Hot Country Songs chart for November 21, 2009". Billboard. Retrieved September 7, 2010. ^ "Hot Country Songs chart for November 28, 2009". Billboard. Retrieved September 7, 2010. ^ "Hot Country Songs chart for December 5, 2009". Billboard. Retrieved September 7, 2010. ^ "Hot Country Songs chart for December 12, 2009". Billboard. Retrieved September 7, 2010. ^ "Hot Country Songs chart for December 19, 2009". Billboard. Retrieved September 7, 2010. ^ "Hot Country Songs chart for December 26, 2009". Billboard. Retrieved September 7, 2010. This page was last edited on 3 July 2018, at 02:16 (UTC).